My name's Maruša. I'm 10 years old. I'm in 4th class. I have a visit. 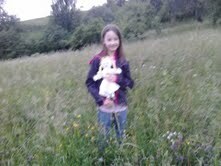 My visit is a doll Ali from Romunia. We are having fun. We are listening to music, we are watching Tv and we are doing the best juice. This is strawberry juice. We love it! So, Ali. I love you and I wll never forget you!